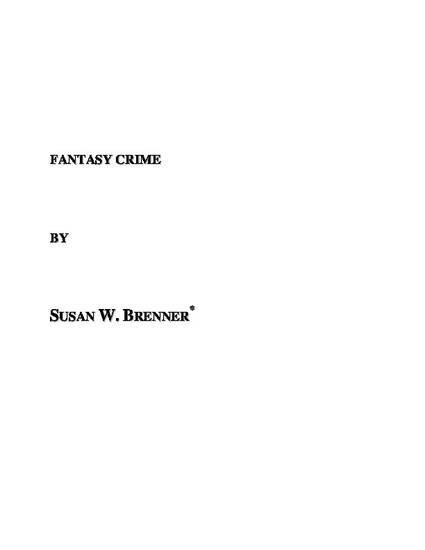 The article "Fantasy Crime" analyzes activity in virtual worlds that would constitute a crime if it were committed in the real world. The article reviews the evolution of virtual worlds like Second Life and notes research which indicates that more and more of our lives will move into this realm. It analyzes the criminalization of virtual conduct that inflicts "harm" in the real world and virtual conduct that only inflicts "harm" in the virtual world. It explains that the first category qualifies as cybercrime and can be prosecuted under existing law. It then analyzes the necessity and propriety of criminalizing the second category of conduct, both now and in the future. The article will be published in 11 Vanderbilt Journal of Entertainment and Technology Law (2008).